Bangin’ questions from She Bangs to The Big Bang Theory. The Picture Round is Money Monikers and the Wild Card Question is an age analytic on the former Man U Welsh wing wizard Ryan Giggs. Q04. Which leaf vegetable is a major ingredient in the Indian side dish of Sag aloo? Q19. Who got to number three in the 2000 UK singles chart with She Bangs? Q24. “There’s no one quicker than these two tungsten tossers…” and “He’s about as predictable as a Wasp on speed” are classic quotes from which former darts commentator? Q32. In Channel 4’s Comedy The Big Bang Theory which of the characters has the favourite number 73? 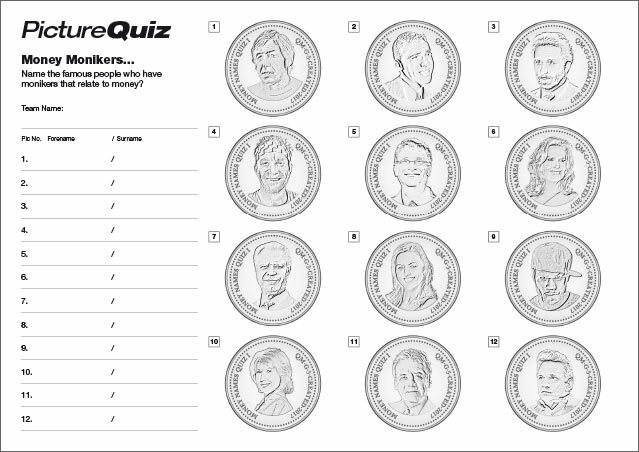 Here’s a low-res sample of the Money Monikers Picture Round, click for a higher resolution version. The Picture Round download is a three page high quality PDF. Depending upon your caliber of quizzers you could use page one which is quite difficult as the quizzers need to guess the full name from the image, page two is a bit easier as it has the initials of the forename and surname (to give the quizzers a clue) and the answers are on page three. The Quiz 67 Picture Round is can you name the famous people with a money related term in their moniker?